Two Proven Ground Breaking Cat Relaxation Downloads.... Designed To Chill Out Your Cat at Home or On the Journey to The Vets. 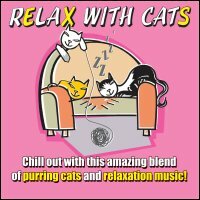 60 minutes of the most relaxing soothing purrs combined with music to drift away with and several layers of sound therapy that combine to give you the ultimate relaxation of the mind and body. A blend of cat purrs, sound therapy and a mix of nature sounds combined with flutes, pan pipes, drums, synths and a range of interesting sounds to relax and energise you as you travel through the 8 tracks. At least two institutions have researched the effects of a cat's purr: Fauna Communications Research Institute in the USA, and The University of Warwick here in the UK. Wounded cats will purr because it helps to heal and strengthen bones and organs. Exposure to similar sound frequencies is known to improve bone density in humans, heal bone fractures and control pain. Purring is believed to have a similar effect to ultra-sound treatment on humans. Only two years ago scientists discovered that vibrations between 20-140 Hz (at low db) are anabolic for bone growth and will also help to heal fractures, mend torn muscles and ligaments, reduce swelling, and relieve pain. Fauna have found that a cat's purr not only matches this vibration, but its dominant frequencies are 25 and 50 Hz - the optimum frequencies for bone growth and fracture healing. All cats, including larger ones such as pumas, ocelots and lions, have further sets of strong harmonics at the exact hertz (number of cycles per second) that generate muscle strength, increase joint mobility and provide therapeutic pain relief. The healing implications for sick humans are exciting, and the fact that many of the new 'sound healing' therapies incorporate toning and overtoning is an interesting footnote. Scientists are now researching whether sound and vibration therapy could halt osteoporosis, or renew bone growth in post-menopausal women and the elderly. "We're bound to learn fantastic things if we are able to genuinely communicate with another intelligent species," says the Institute. "We also hope to provide the world with a whole new generation of non-invasive, simple and affordable healing methods." Ultimately, through its work with language structure, the Research Institute hopes to create 'common languages' between humans and animals. This would offer a unique learning opportunity and, the team hopes, foster greater respect for the animal kingdom. "Humans tend to equate communication with intelligence - perhaps the public would do more to protect these creatures if they consider them knowing." Fauna Communications is a non-profit research institute and can be contacted at Fauna Communications Institute, PO box 1126, Hillsborough, NC 27278, USA. www.animalvoice.com. Dr June McNicholas of the University of Warwick found from research how non-human relationships can be as significant as those we have with other humans, particularly for older people. Her work over the past decade in the area of pets and residential care for the elderly has led to an increase in understanding by care workers of the crucial role that pets can play in older people's lives. It also led to an increase in the number of residential care homes that will accept pets. Research carried out by Dr McNicholas in Wales a few years ago found that 57% of residential homes have a policy about pets and, that two-thirds would accept pets, including cats. Cats can provide considerable emotional support during the early stages of spousal bereavement. Cats can provide support for women with breast cancer. Cat owners have fewer psychological and physical health problems. 90% of children with cats rate their feline as being in their top ten special friends. 3. Cats as preventive medicine! A study by the Institute of Paediatrics and Adolescent Medicine in Munich found that young children who were continuously exposed to cats were 67% less likely to develop allergic asthma and 45% of them were not as susceptible to developing hay fever as other children. Purrfect Symphony is the product of collaboration between sound therapist/producer Jeff Moran MA with psychotherapist and author Jack Stewart MSc. It began with a dream one night in 2002, when earlier that evening Jack had been wincing at scenes of human and animal carnage in Zimbabwe. Feeling powerless to help, in his dream one of his cats (Tommy) appeared and the message was to use the sound of cats purring to change forever the way animals were perceived. The purrs of cats (meet them on the Cats page) were painstakingly recorded, and three themes emerged, themes backed up by scientific research (see Research page). It has always been known cats help people relax, our first theme. We discovered then that purring energises and helps enhance health and well-being; our second and third themes. The sounds of specific purrs were chosen, and mixed with the music and sounds of various instruments (see Music CD page). The result is truly amazing. So, if you are a cat lover (there are eight million domestic cats in the UK, and over sixty million in America), what you have always known (or suspected!) is now being made available to everyone. That cats (animals) are more than mere companions, they posses the capacity to induce deep states of relaxation, can energise and heal. 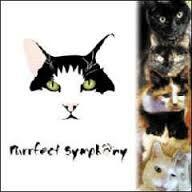 This CD is for cat lovers and those who previously had no inkling of the power of nature to help the human race in this way (see Animals are Perfect page). In other words, everyone. We are deeply indebted to all our cats, our cat 'keepers' (does anyone ever own a cat?) and Fauna Communications Institute. Thanks go also to Dr June McNicholas at the University of Warwick (UK), the Institute for Social Paediatrics and Adolescent Medicine (Germany), Cats Protection (UK), and the Humane Society of the United States. On these pages are some facts about cats, and the views of famous people about cats & animals in general. Cats are the UK's favourite pet with 4.5 million households owning 7.7 million cats. Cats are the No. 1 pet in America, with approximately 77 million kitties (compared to 55 million dogs). The ancient Egyptians realised the cat's potential as a vermin hunter and tamed cats to protect the corn supplies on which their lives depended. The most popular cartoon character in the world is Garfield, the world's laziest cat. The cartoon strip is read in 2600 newspapers by 260 million readers around the globe. Sir Winston Churchill owned an orange tabby cat named Jock who attended many war-time Cabinet meetings. Alexander Dumas (author of The Three Musketeers) had a cat called Mysouff. Mysouff could predict what time his master would finish work, even when he was working late. Charles Dickens had a female kitten that was known as "Master's Cat". She kept him company in his study as he wrote, and when she wanted his attention she would snuff out his reading candle. The prophet Mohammed loved cats. The story is told that at one day when he was being called to pray he noticed his cat, Muezza sleeping on the folds of his sleeve. Rather than disturb the sleeping cat, Mohammed cut off the sleeve of his robe. A thirteenth century Egyptian sultan left his entire fortune to the needy cats of Cairo. For many years afterwards homeless cats received a free meal daily. Isn't it wonderful to know you are in such good company? To be honest I can't put my hand on heart and recommend any of these. What I can say is that through a process called Classical Conditioning (mental pairing) then if a noise CD is played enough times then the cat or dog will get used to the noises and not become frightened when it hears them socially or say for example with fireworks or the horn of a car or washing machine. So they can really be of benefit but need to be played frequently till the pet is used to the sounds. The process is called desensitising and its often used with children or people with phobias.